Anannya, a fortnightly feminist magazine of Bangladesh, on Saturday awarded 10 women of the country for their outstanding contributions to their respective areas, reports UNB. 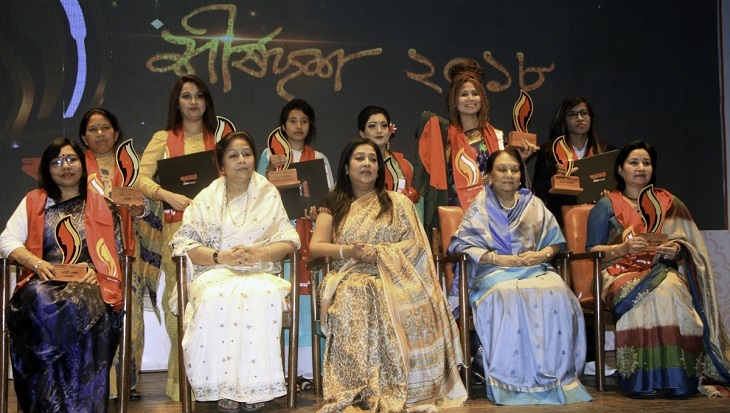 "Anannya Shirshodosh 2018" awards were handed over to the distinguished women for their outstanding contributions at a ceremony held at the National Museum in city's Shahbag area. The recipients of the prestigious awards are Dr Sayeba Akter (Medical), Parvin Mahmud (Management and Development), Shamsunnahar (Administration), Afroza Khan (Entrepreneur), Soma Rani Ray (Handicraft), Laili Begum (Journalism), Nazmun Nahar (Youth Icon), Sweety Das Chowdhury (Dance), Rumana Ahmed (Sports) and Fatema Khatun (Technology). The editor-in-chief of Anannya Magazine, Tasmima Hossain, in her welcome speech lauded the awardees for their extraordinary achievements upholding the spirit of Bangladesh. Members of National Parliament Ismot Ara Sadeka and Subarna Mustafa, also noted actress, among others, were also present at the event. Anannya Shirshodosh award giving ceremony was first took place in 1993 and this year's ceremony marked the 25th anniversary.